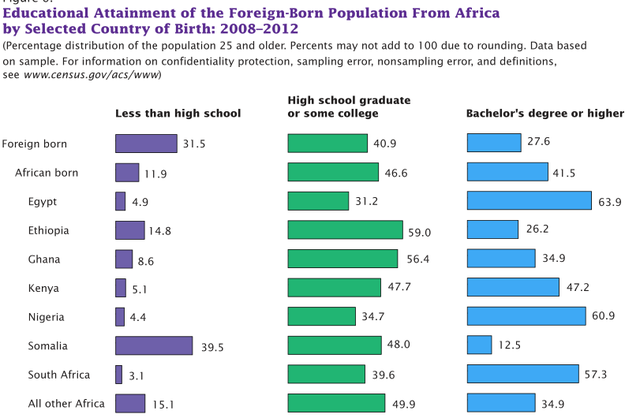 Census: Foreign-born Africans Most Educated Immigrants in the U.S.
New York (TADIAS) – According to the U.S. Census Bureau’s latest American Community Survey 41% of the African-born population in the United States obtained bachelors degrees or higher between 2008 and 2012 compared with 28% of the overall foreign-born U.S. population. The study, which was released this month, indicates a rapid population growth among the foreign-born African community in the United States. In the past two decades, the document says, a large number of Africans came to America through the Green Card lottery system, which partially explains African immigrants’ higher educational level. “A relatively high proportion of immigrants from Africa entered the United States on diversity visas (24 percent as compared with 5 percent of the overall foreign born), which require a high school diploma or equivalent work experience,” the report states. In the Washington, DC, metro area the foreign-born population was more than three times the national percentage (13 percent). In addition, several other U.S. cities are spotlighted as having pockets of African-born populations (between 20,000 and 35,000) such as Columbus, Ohio and Baltimore, Maryland. While Midwestern states like Minnesota are mentioned as magnets that attract East African immigrants including Ethiopians and Somalians, the West Coast numbers are below the national average: Los Angeles (1.5 percent), San Francisco (1.8 percent), and San Diego (2.2 percent). You can read the full report at www.census.gov.